The U.S. Individuals with Disabilities Education Act defines the concept of the Least Restrictive Environment as the opportunity for a student with a disability to be "provided with supplementary aids and services necessary to achieve educational goals if placed in a setting with non-disabled peers." (Daniel R.r. v. State Bd. of Educ., 874 F.2d 1036, 1050, 5th Cir.1989) This concept of providing students with "supplementary aids and services necessary to achieve educational goals" could be applied to all students. By leveraging the capabilities of mobile devices, teachers can support their students in creating a personalized learning environment with the least number of barriers. I want to be independent, but sometimes your curriculum is the disability. When you give it to me in paper form, I can't access it. When text is digital, I can manipulate it. I can make it bigger, pick the right font, add more white space -- it's easier to read. When text is digital, I can add a voice and listen to it. I don’t have to struggle with reading each word . . .
By providing students with the option to access content on a mobile device, we begin removing many of the restrictions previously placed upon their learning environment. Depending on the device, text-to-speech may work in a variety of ways. On iPad, enabling Speak Selection in the Accessibility features not only allows all text to be heard, but -- as of iOS6 -- also includes word highlighting. Greg Kulowiec (@GregKulowiec) introduces this feature in the video below. For students working on any laptop with the Chrome Browser, or on a Chromebook, the Chrome Speak app and iSpeech Select and Speak extension convert web articles, Google Docs and even test questions into audio -- as shown below by Kit Hard(@kithard). 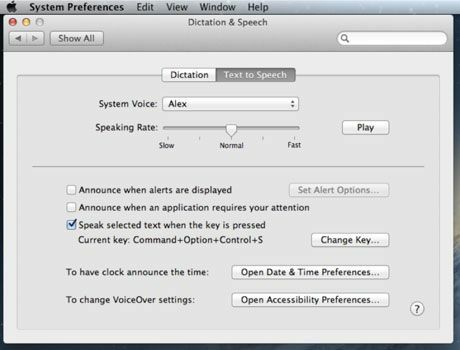 And on any Mac product, students can access text-to-speech in two different ways. 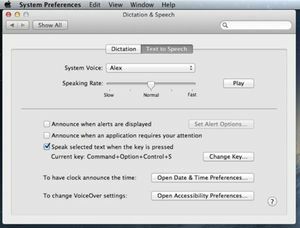 First, within any program, they can highlight the desired text and then access Speak Selection from the Edit menu (Edit>Speech>Start Speaking). Second, it is possible to configure custom keystrokes in the System Preferences. My elementary students loved using these two techniques in our Mac lab -- both for reading online as well as to support their writing process. When allowed to customize the listening experience in terms of the voice, speaking rate and keystroke, they also started taking more ownership of their learning process. With mobile devices, neither we, as educators, nor our students are limited to a single modality for presenting content or demonstrating understanding. Regardless of the device, the potential exists to create and consume images, audio, video, text and more. Imagine if teachers included QR codes or Augmented Reality with paper-based activities. Linking to multimedia content, as illustrated in this video from Paul Hamilton (@PaulHamilton8), increases the likelihood that all students will connect with the content. What might students create if they could choose the tool that best supports their ability to demonstrate their understanding and meet the desired learning objectives? Rather than being told to start with a designated product, such as an essay or poster, think about what may happen if students are instructed to create the product that best represents their learning. When the focus shifts toward the achievement of learning objectives, rather than the completion of a specific product, students can start to create and innovate within a virtually limitless environment. In the same way that students determine their preferred method for studying, such as using flashcards or writing lists, they will also identify the digital features that best support and demonstrate their learning. Text-to-speech may unlock content for some students while being irrelevant to others. Adjusting text size or watching video may be empowering for one group, but not all. In his EducationWeek.org article, Special E-Readers for People with Dyslexia, Justin Reich (@bjfr) says, "In the print vs. screen debate, the answer will probably always be 'it depends.' It depends on the person, the text, the task and the context." Mobile devices won't have the same impact on all students, but they will allow teachers to work with "it depends" in meaningful ways. 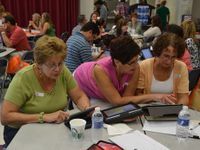 They can use the features of iPads, Chromebooks, Android and laptops to guide the creation of a Least Restrictive Environment for all of their students. Not only that, students become architects of their own learning environments because they can determine the aids and services most applicable to them.